The 2019 Mazda MX-5 Miata RF is a 2 passenger Automatic or Manual transmission, Two-seater Passenger Car. It is available in 3 trim packages, the 30th Anniversary, Club, and Grand Touring. The new Mazda MX-5 Miata RF invoice price ranges from $30,569 to $35,907, while MSRP ranges from $32,345 to $37,995. 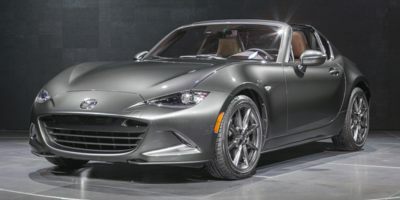 The 2019 Mazda MX-5 Miata RF is available in 8 exterior colors, Arctic White, Ceramic Metallic, Eternal Blue Mica, Jet Black Mica, Machine Gray Metallic, Racing Orange, Snowflake White Pearl Mica, and Soul Red Crystal Metallic, and 5 interior colors, Auburn, Black, Black w/Red Stitching, Recaro Black, and Sport Tan.